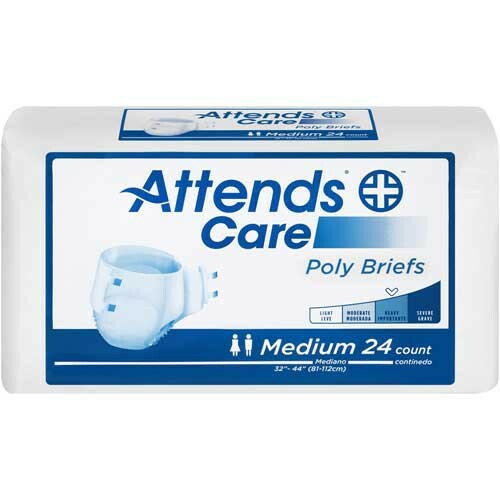 Attends Poly Briefs BUY Adult Incontinence Briefs, Attends Briefs, BR20, BR25, BR30, BR40, Adult Briefs. 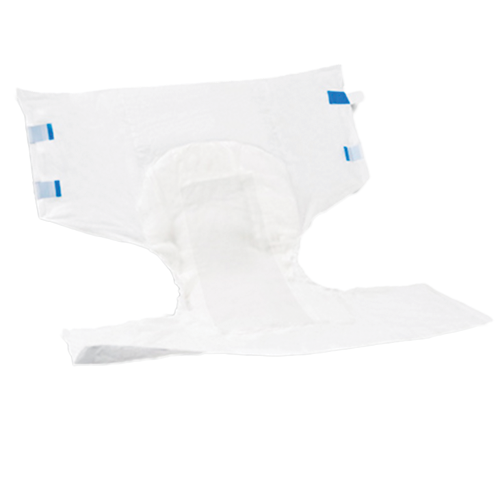 Attends Poly Briefs are competitively priced with excellent acquisition speed, capacity, and leakage protection for ultimate skin wellness. Unisex Briefs with a tailored fit in a full-coverage. 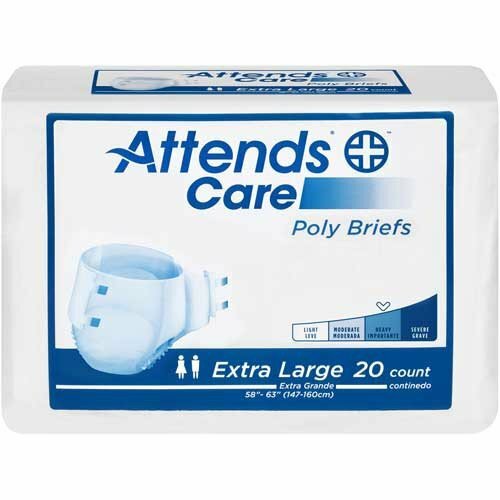 Attends Briefs come with Easy-Fit Tapes for easy refastening ability. 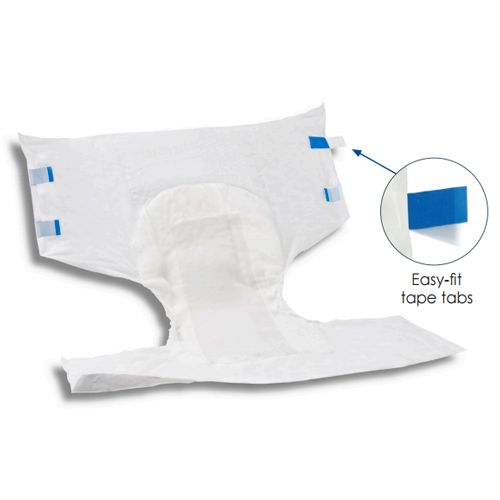 These adult briefs come with a Microporous acquisition layer rapidly absorbs fluids and keeps them from resurfacing. Absorbent polymer helps control odor and locks wetness away. A pH-reducing cellulose fibers layer is also included. Soft, cloth-like inner liner is gentle against the skin. Poly outer covering prevents leakage and provides ease of positioning. Easy-fit tape tabs for re-fastening without tearing. 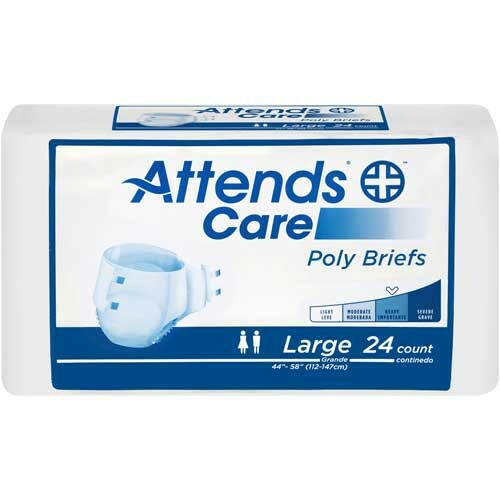 Attends Poly Briefs are packaged in discreet outer cases. Absorbent polymer helps control odor and locks wetness away from skin. Microporous acquisition layer rapidly absorbs fluids and keeps them from resurfacing. Excellent acquisition speed, capacity, and leakage protection for ultimate skin wellness. Product Numbers: BR20, BR25, BR30, BR40. Sizes: Medium, Regular, Large, X-Large. Sizing Ranges Waist / Hip: 32-44 Inch, 34-56 Inch, 45-58 Inch, 58-63 Inch. I really like this product, it has a ploy- plastic backsheet not cloth. Thick but not too thick. I would of gave 5 stars if they didn't make them with the dry sheet inside the middle, their not soft at all inside the middle. If they could make them without the dry sheet they would be perfect. Why would anyone give this diaper any kind of positive review? This has to be one of the worst diapers I've ever used, and I've used many brands over the years. It's along the line of store brand junk. Besides the absorbency issue the tapes don't hold and the poly cover easily rips. Considering all this they are overpriced. Having tried many products and been unsatisfied... I find this product to work very well for me.. still a very active and fairly your man... they are discreet and provide me with the confidence I and protection I need... the tapes stay put and are very comfortable .. thank you attends ! 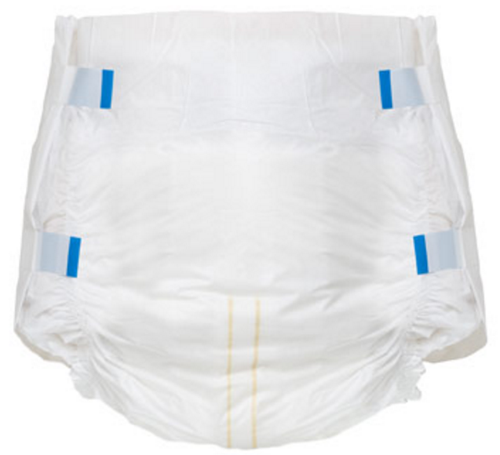 This is a good affordable diaper that provides protection yet is not real thick. It is comfortable to wear and will hold the BM that I have in them. 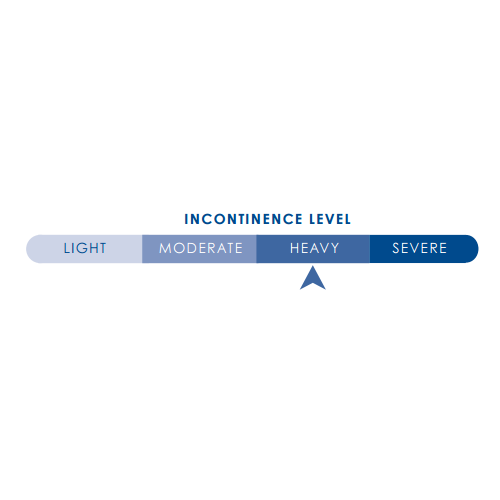 I have a weak colon mussel and must wear diapers when I go out. This is not the most absorbent diaper but for my use works very well. The plastic backing holds it all in the seat without leaking out. It will leak out the sides if heavy wetting. Recommend for those who need protection from uncontrolled BMs. The large fit me very well. By far the best diaper I have ever had for the money. Can wet it three times before the leaks start. This is by far the most affordable briefs I bought for my dad. When I say affordable, it also means that for its price, the quality competes with the more expensive brands. It is made of materials which keeps dad fresh feeling. No skin irritation for him as well. I was very satisfied with the service. They went above and beyond. Briefs are sturdy, absorbant and reliable. Totally satisfied.